The Obaji Blue Peel – a gentle chemical peel for smoother, firmer skin. Your skin protects you from the environment and regulates your body temperature. Skin is made up of millions of cells. It is the largest organ in your body. Each day, thousands of these cells die, fall off, and are replaced by new cells from beneath the skin. As you age, this process begins to slow down. Dark blotches, signs of aging and sun-damage begin to appear. Your skin may become dull and develop fine lines and small wrinkles. OBAGI Blue Peel treatments are performed by our doctor for patients in our region to restore healthier and more beautiful skin. Unlike Glycolic Acid and Alpha Hydroxy peels, the OBAGI Blue Peel uses a slow-acting TCA (trichloroacetic acid) solution applied to the skin to remove dead skin cells and stimulate the production of new skin cells. Since TCA is not absorbed through the skin, there are no internal toxic effects. The slow action of the OBAGI Blue Peel solution enables your surgeon to control the peel process and its depth. It tightens the skin, reduces wrinkling and renews a more youthful appearance. During your consultation, please remember to tell our physician about any history of viral infections, sensitivity to the sun, or prior skin treatments including dermabrasion or Accutane treatments within the past six months. Also, explain the level of skin improvement you wish to achieve. Your physician will review your medical history and examine your skin type and pigmentation to determine how many OBAGI Blue Peels will be required. What areas can be treated with OBAGI Blue Peel? Unlike laser peels, OBAGI Blue Peels can be performed on the face, neck, chest, hands and even the arms and legs. What conditions can an OBAGI Blue Peel treat? An OBAGI Blue Peel can effectively improve a wide variety of skin conditions including fine lines and wrinkles, uneven pigmentation, shallow acne scars, sun-damaged skin and freckling. 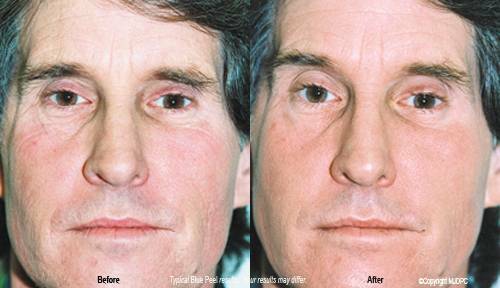 An OBAGI Blue Peel is not a substitute for a facelift, or rhytidectomy. It cannot eliminate excessive or lax skin. But, in many cases your physician may suggest that an OBAGI Blue Peel be performed in conjunction with other cosmetic procedures. 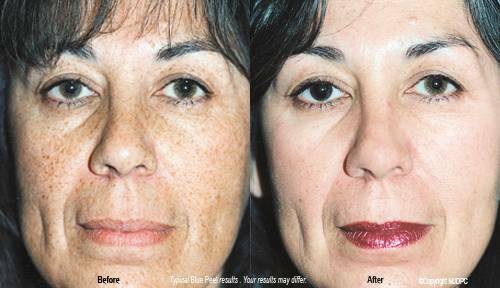 What is an OBAGI Blue Peel treatment like? OBAGI Blue Peels take 25 - 30 minutes and are performed on an outpatient basis in your physician's office, usually without sedation. If your physician indicates sedation, you will need someone to drive you home. Depending on your skin type and the desired results, you will probably require from 1 - 4 coats of OBAGI Blue Peel solution applied to various areas of skin. 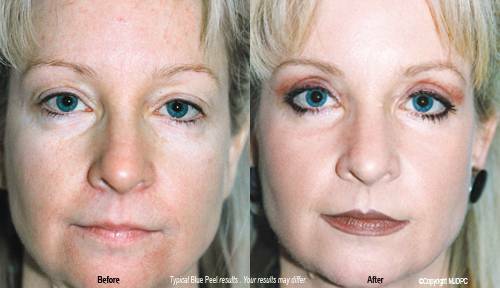 Once applied, the OBAGI Blue Peel produces a separation and peeling of the outer layers of the skin. Most patients experience a warm to hot sensation, which may last as long as 2 - 3 minutes, followed by a stinging sensation. NU-DERM is the only proven treatment designed to provide tighter, smoother, healthier, younger-looking skin, regardless of age, color or skin type. Your physician will prescribe a NU-DERM home skin care treatment program to ensure proper healing. What will recovery from an OBAGI Blue Peel be like? After our doctor performs your OBAGI Blue Peel, the peeling takes place within 2 - 3 days. This stimulates the production of new skin from beneath. Healing continues for another 7 - 10 days. Your new skin will be slightly pink. This will gradually fade over the next several weeks. Cosmetics can be applied after about 3 weeks. Following your OBAGI Blue Peel, your new skin will be tighter, smoother and slightly lighter in color than it was before your peel. Remember, your new skin will be soft and sensitive. It is important that you avoid any exposure to the sun. Always apply a sunblock of at least SPF-15 twenty minutes before you go outside. One of the things patients like the most about OBAGI Blue Peels is that they don't disrupt their normal activities!